A few days ago, we came across a new inspiring story from the other side of the world. 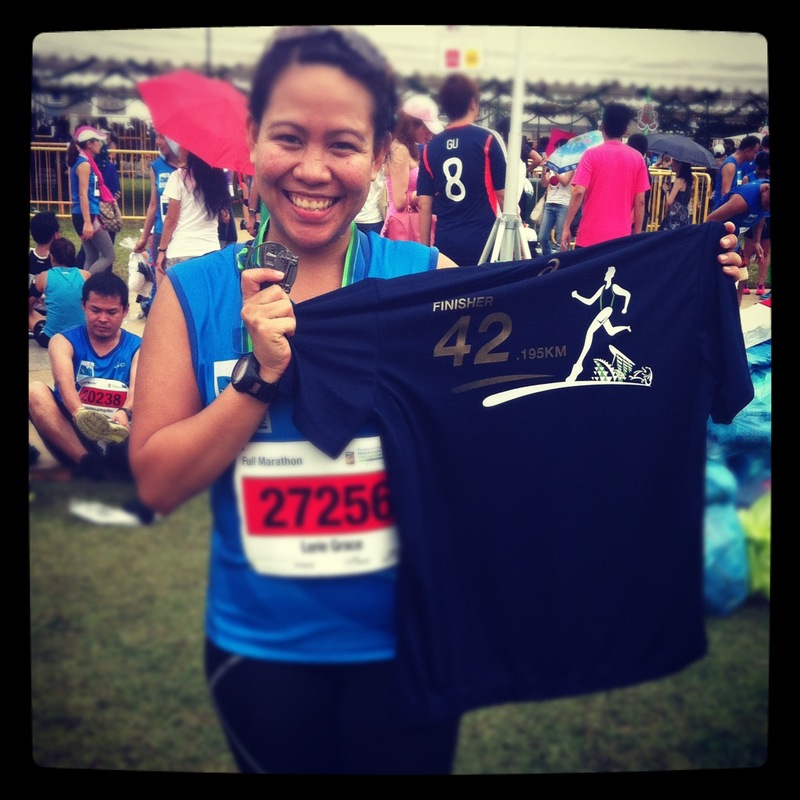 Lerie, from Singapore, shared a picture of her first 10K on Instagram, done almost 3 years ago. Since she started running, she crossed 12 finish lines, including half and full marathons with the help of our apps! Lerie is living proof that, regardless your fitness level, you always can challenge yourself and accomplish big! Read her full interview and get off the couch and into your sneaks! – Share a little bit about yourself? My name is Lerie and I am 29 years old. I was a teacher but I am now a stay-at-home mom to my 20 month old son. I was born and raised in Bangkok, Thailand but have been living in the lovely clean, green, runner-friendly city of Singapore for the last 7 years. – Why did you start running? I started running because my then 25 year old self was sick and tired of being so unfit that I could barely even walk up a flight of stairs without gasping for breath. Running seemed like the simplest sport/workout to start off with. – What challenges did you face when you began? It wasn’t easy when I started because I hadn’t been active for so many years. On my first few runs I felt sick and exhausted. I felt like I would never get the hang of running. I had to fight every excuse and take the first step out the door each time. It was just so much “easier” to just sit on my couch and let time pass by. – What was your first Bluefin app? How did you find it? My first Bluefin app was Ease into 5K. I randomly read an article online about the best apps to use for health and fitness and they mentioned this app. Back then it was first called Couch to 5K and I was totally drawn to it because I feltl like a couch potato who wanted to run. So I checked out the app and the rest is history. I loved how the app/program was not overwhelming or scary in the sense that running 3 times a week and reaching my goal in 8 weeks sounded pretty realistic. The description clearly states that it was made for people who had never run before (me!) plus knowing that I could walk while training made it less intimidating. I enjoyed knowing the exact time, distance, pace and route and sharing my achievements/progress with friends and family on Facebook. The journal part was also fun for me because I was able to see how I improved. I can sincerely say I wouldn’t be where I am now in running if it weren’t for discovering Bluefin apps. – Tell us about your progress: What made you go from couch potato to marathon racer? How many races do you have under your belt so far? Well, as I continued to follow the Ease into 5K program I actually saw and felt progress! I could actually run further and longer than I thought I could each time and I loved having the record and seeing the stats of my run. I was ecstatic when I could actually run 3 minutes straight without stopping! I couldn’t believe myself when I actually ran 3km so you can imagine my happiness when I actually reached 5km. After that I wanted more. I wanted to challenge myself. If I could come this far I could go further right? Since the Ease into 5K worked so well for me I moved to the Bridge to 10K app. Needless to say, I reached my goal and achieved something I never even thought of dreaming which was running a 10K. I told myself if I couldn’t even climb up a flight of stairs without feeling out of breath but now I could run a 10K that means I could go even further right? So I trained and ran for my first half marathon and since I didn’t want to be half crazy I trained and ran my first full marathon too! For both, I used Hal Higdon’s Novice 1 Half Marathon and Novice 1 Marathon app. I loved how these apps were catered to a newbie runner like me. I am just so glad I found what worked for me. I didn’t dare to dream or imagine how far I could go but I kept surprising myself. My first run to my full marathon all happened in a span of less than a year and a half. Here in Singapore, races are quite costly so I haven’t joined as many races as I would like to but I currently hold 12 medals. – What has changed since you started running? Physically I did lose some weight, but I also gained confidence from running that carried out to my work and relationships. A huge difference I felt was my energy. I had the energy and the enthusiasm to do things that normally tired me out or made me cranky. I felt like a new person and everything in life just seemed more positive and meaningful. There was no looking back. I never wanted to be that unfit person again. Even after having my first child, I dragged myself out to run again because I didn’t want that to be an excuse. Running has made me love life and health more. I didn’t realize how much I would love running, how much of an impact it would have on my life and how important it would be to me. It has changed my life so much that I even started a blog focusing on my running and healthy lifestyle journey: iactuallyrun.com. – Any big motivators during your workouts that have helped you to keep running? I would remind myself to compare myself to the person I was yesterday. To not forget how far I have come. I became even more motivated because friends and family actually were inspired by what I had achieved in running. Lately, it has been my son and having a family and wanting to stay healthy for my family that keeps me running. My dream is passing on the joy of running to my son and future children and us running together in races. – What advice would you like to give to newbie runners? Challenge yourself, give yourself the chance to look back and see how far you have come. Every run will be a miracle because it was something you never knew or imagined you were able to do. If an ordinary person like me can do something beyond what I ever imagined doing, you can do it too. Patience and starting bit by bit will get you somewhere. You will be amazed at what you and your body can accomplish if you just set your mind to it! This entry was posted in Motivation, Success Stories and tagged Bridge to 10K, Ease into 5K, Hal Higdon, Marathon, success story. Bookmark the permalink.